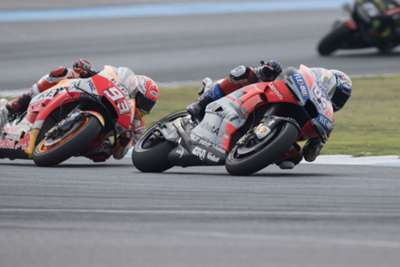 Andrea Dovizioso is prepared for another duel with Marc Marquez in Japan and expects the Spaniard to go all out from sixth on the grid in his bid to seal a fifth MotoGP title. Dovizioso gave himself a great chance of preventing Marquez from being crowned champion yet again this weekend by taking pole in Motegi on Saturday. Marquez will be guaranteed another title if he wins a third consecutive race on Sunday and can also wrap it up without a victory depending on where Dovizioso finishes. The Honda rider will start on the second row, having been quickest in the final practice session after crashing at Turn 9. Dovizioso expects the championship leader to get off to a flyer and would not be surprised to be engaged in another battle after they were involved in a dramatic final-lap tussle in Thailand last time out.